Barack Obama would desperately like to shoot the underdog. She’s wounded and she limits the healthy members of the group from making any forward progress. Too bad the small town people in Pennsylvania who cling to guns or religion couldn’t spare the ammo to deliver the fatal shot. And so we move on. The American media is jumping on the Clinton camp’s statements that this fight will go to June or even to the convention this summer. She has pointed out that with this victory, and if you include the vote totals from Florida and Michigan, she is leading in the popular vote. Which is true, but Florida and Michigan aren’t in play. The fact remains that Clinton is still battling from behind. She is trailing in the delegate count, popular vote totals (sans Florida and Michigan) and the number of contests won. She’s losing in all the categories that everyone likes to call ‘objective measures’ and seeing this, Senator Clinton knows that she must cast doubt on Senator Obama to have any hope of making further headway. Or if not headway, she can hope to further damage his now vulnerable persona. Expect Clinton to hammer on the electability question and claim that her victories are more meaningful for November, despite there being fewer of them. Let’s see her take on electability first. Senator Clinton is claiming that Obama cannot be elected over McCain because he is too untested and too open to the vicious attacks the Republicans will throw at him. This is the smart move on her part. Her campaign has been pointing to his inexperience from Day One and as we get closer to November, this is just another way of her illustrating her experience over his. However, she is just as open to this argument as Obama is. Clinton’s negativity rating nationally is incredibly higher than either McCain or Obama and therefore the electability question cuts both ways. If she insists on going down this road, she will need to be prepared for the consequences. Clinton’s second argument is that the states that went for her contain more swing voters that will be an important demographic in November. This might be the more solid claim she has on her side. Her appeal spans older people, working-class whites, and women – those independent minded voters who may have voted Democratic in the primary season, but will surely be tempted to vote Republican in November. In theory, this is the right move for her. If she can claim the mantle of populist, her vote totals in swing states will only grow. Arguably, this does translate into her being the more ‘electable’ candidate in November. But past performances are no indicator of future trends. If she can successfully argue the point, I still doubt it will mean a perceptible difference in the outcome of the nomination. She has barely made a dent in Obama’s delegate totals even though she is picking up larger, more independent-minded Purple States. 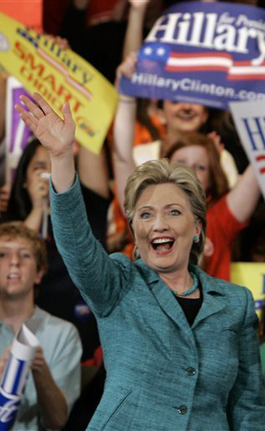 The numbers simply don’t match her arguments – nor does the thought that she is more electable than Obama. With nearly 20 years in the national spot light, those swing voters that liked her in Pennsylvania have six months to remember why they typically vote for a Republican for president. Despite her win, her arguments are only words and do not transform the numbers that simply aren’t on her side. She is building a house of cards that may topple with her having to accept defeat or battle bitterly for a runner-up Veep spot on the ticket. I just don’t see this going her way. 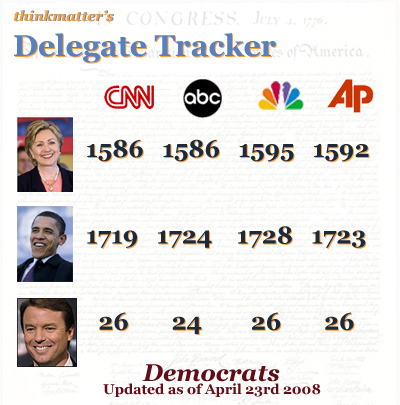 And now… the new Delegate Tracker. There won’t be Nobama by the time she is done and over. Our junior senator from Ill has no clue that this is just the begining of a rather protracted end unless the party can engineer a joint ticket. Good point. She is surging despite Obama’s attempts to finally put the nail in the coffin. I think it is partly a function of more blue-collar workers in PA, partly the more centrist message she is putting out and partly the fact that a lot of these folks find her views more in line with what a typically GOP nominee would be talking about. She’s certainly the more ‘independent’ of the two Dems in the race and I think that is what is working for her in states like Ohio, Texas and PA. Voters who usually like the Republican nominee are falling in her lap right now. And she’s hammered Obama on the electability issue and has done are the right time – just a week or two before people cast their ballots. It’s a time tested and very good strategy for her or any politician. I don’t want to take away from her gains and I have to say she’s making all the right moves despite the incredible odds against her. I find it funny that we all expected Clinton to win Pennsylvania, we expected Obama to lost from up to two months before, to the second the polls opened, we knew Obama would lose, but since then we are acting like it is a HUGE surprise that Obama lost.. by 9 points. If and when Clinton loses North Carolina are were going to hammer Clinton for it, or are we going to treat it as the expected outcome it was? Clinton has the BIG Clinton name, she has Bill and Chelsea working for her, while the only recognizable name Obama has to campaign for him, is himself. No matter how much money Obama spent in Penn. Clinton had the state tailor made to her base, had successfully made it a “home state” and started with a 20+ point lead. He narrowed it to a 9 point victory for Clinton. Obama may not be winning these purple states, but if the DNC tells Obama, the WINNER, that he lost the nomination to Clinton…. Everyone who voted for Obama wont vote for Clinton, not if they see the primary result as their votes being overturned. I know I wont vote for a Democrat again. Clinton supporters are ready to say we can’t CAN’T disenfranchise Michigan and Florida, we NEED their votes in November, but they have no problem telling the people who voted for Obama in the contests he won (30 to Clinton’s 15) that they don’t care who won your contest, we’re nominating who we want to. The Democrats can’t win if they do that. I also find it funny that Clinton has won 3 out of the last 8 contests, and before that Obama won 14 in a row, and they are saying that CLINTON has the momentum. Obama has won 17 out of the last 20 contests… Who has the momentum there?